April 3, 2019 – Los Angeles – The United Premier Soccer League (UPSL) is excited to announce Olimpia Alaska FC as a new league member kicking off with the 2019 Summer Season. Based in Anchorage (Alaska), Olimpia Alaska Futbol Club will begin play in the UPSL Northwest Conference, and is finalizing its venue options in compliance with UPSL Minimum Standards. 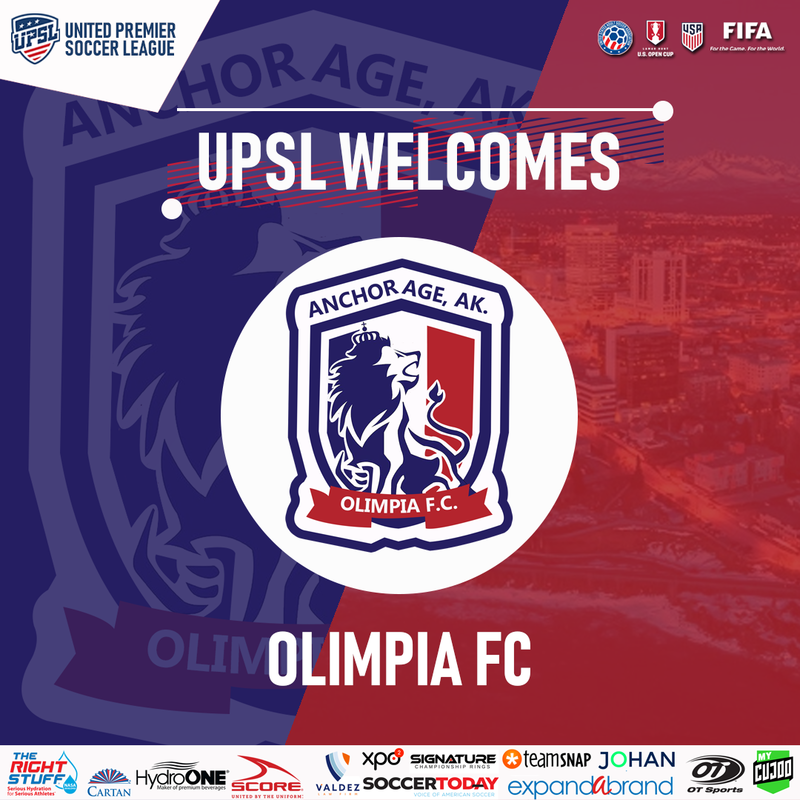 United Premier Soccer League National Director Matt Kahla said, "It's great to see the Pro Development scene in Alaska bursting with clubs ready to take the next step, and we're pleased to welcome Olimpia Alaska Futbol Club to the UPSL. Word is really starting to spread in the Great White North about the UPSL, and Jose Osequeda is a smart soccer and business man who knows a good thing when he sees it. We're excited to see Olimpia Alaska FC take the field this summer, and wish the club the best as it prepares for the season ahead." Olimpia Alaska FC has participated in the Anchorage-based Soccer Alaska league since 2015, and has played competitively against several of the new UPSL Alaska clubs. Olimpia FC placed third (5-1-4 overall) during the seven-team Soccer Alaska 2018 Winter Season campaign. Jose Osequeda is the Owner and Head Coach of Olimpia Alaska FC. A native of Honduras, Osegueda, 28, is a graduate of Anchorage (Alaska)'s East High School and is currently a local business owner. Olimpia Alaska FC Owner and Head Coach Jose Osegueda said, "We've heard good things about the UPSL we're excited to be joining at the same time as so many good Alaska clubs. This will motivate our players more than playing in the leagues here, It'll be a better environment for development, and with teams popping up all over it'll be good fun for us to travel to play in some different cities." Jonathan Lopez will serve as Assistant Coach for Olimpia Alaska FC. Olimpia Alaska Futbol Club is an American Soccer club currently based in Anchorage, Alaska, and a new member of the United Premier Soccer League. Olimpia Alaska FC will play in the UPSL's Northwest Conference. Founded in 2015, Olimpia Alaska FC can participate in the qualifying rounds for the Lamar Hunt U.S. Open Cup through their affiliation and membership with the UPSL, the U.S. Soccer Federation (USSF) and the United States Adult Soccer Association (USASA).